Click on the image to find out more in detail. Storybooks that focus on the development of good characteristics for children. Build healthy emotions and positive thinking with Mind Coaching Books for Kids. Written by Early Childhood Education Professors, books from this series are published in USA and Australia. A unique series of beautifully illustrated children’s storybooks designed to teach children about good leadership and to guide, encourage and motivate children to become great leaders. This unique series develops children's cognitive language skills, emotions and self-esteem with a unique approach. These delightfully illustrated books highlight feelings and character traits in a way children can relate to. At the end of each book, activities encourage children to talk about their emotional response to the story and put those feelings into words. Using the 'government preschooler education course', which has been implemented in Korea since March 2013, each title deals with a very practical and essential topic. E.g. learning toilet courtesy, protecting oneself from sexual violence etc. 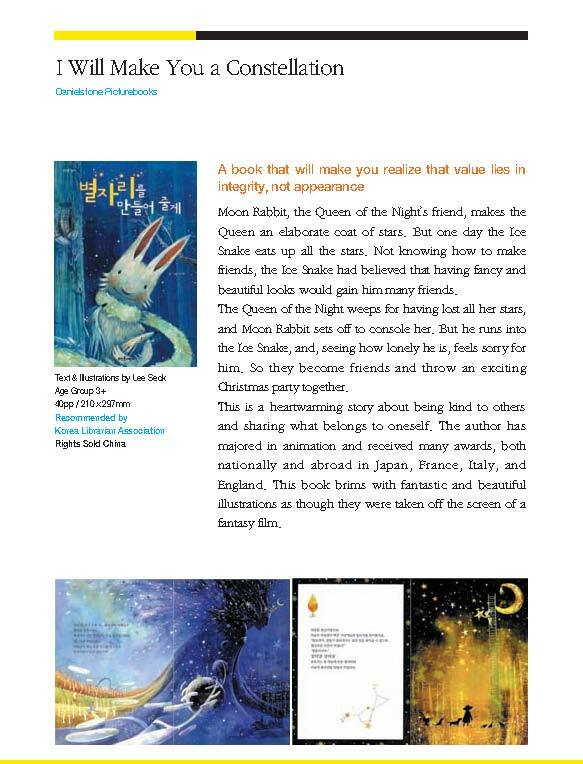 Moon Rabbit creates the stars in the night sky. But one day the Ice Snake eats up all the stars thinking it will have friends if it has pretty stars...This story tells you that value lies in integrity, not appearance. The Books that Help Children's Emotional Development! In early childhood, wounded feelings that are not healed adequately make it hard to develop an integrated personality later on. This is because negative emotions are made in that particular period. This color book series is based on positive effects that the colors such as red, blue and yellow have. Black Princess breaks the discrimination and prejudice! Women must be obedient and good, stepmothers are evil... there is a lot of prejudice and discrimination towards women in classic stories and traditional fairytales. Six rewritten versions of classical fairytales break old prejudices and recreate the image of princesses, sisters, wives and mothers who have traditionally been depicted as passive and subservient to men.